All your dental needs under one roof! Come have a look inside our state-of-the-art city centre clinic. 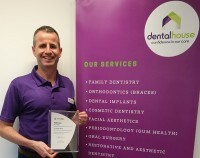 DentalHouse's specialist orthodontist Dr Ronan Perry was recently presented with an Invisalign Platinum Provider Award.